Combine vinegar, Mirin, ginger, sugar and salt; bring it to a boil, stirring occasionally. Turn off and let sit for 10 minutes Pour liquid through strainer over slaw mix, cool and marinate overnight in refrigerator. In large pan, heat oil to smoking point. Pan-fry steaks to medium-rare (140° F internal temp.) or desired doneness. Cool. 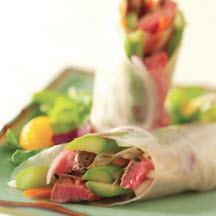 Place spring roll paper in hot water until it becomes pliable. Towards the bottom of each paper, place 1-ounce vegetables, 1 1/2-ounce beef and 3 asparagus spears. Roll like an large egg roll keeping it firmly wrapped. In medium-sized bowl, place Mediterranean salad mix. Drizzle salad dressing around sides of bowl and toss to coat with dressing. To assemble, place 4 mandarin oranges on plate and top with 3-ounce salad mix 1/2-ounce chow mein noodles. Nutritional Information Per Serving (1/4 of recipe): Calories: 595; Total Fat: 22g; Saturated Fat: 4g; Cholesterol: 37mg; Total Carbs: 78g; Fiber: 4g; Protein: 22g; Sodium: 5300mg. Recipe and photograph courtesy of Certified Angus Beef LLC.